Today was the longest day we’ve had on the bike yet – 10 hours, with two 10 minute and one 30 minute break. We didn’t cover an impressive distance, but the road – wow. If you’re from Australia’s east coast, think of Bulahdelah – before the bypass was built. And now imagine driving up and down Bulahdelah for eight hours straight. In 30 deg C. If you’re not from the east coast or didn’t ever drive from Sydney north to Forster in the 80s and early 90s, think of the most windy road you know, imagine a road 50% more windy, and one that just goes up and down and back around through valleys and over mountains for hours and you’re getting close. Even on a bike, with my helmet visor partially open for air, I was feeling car sick (bike sick?). Bleh. Adrian reckons that if it were in the US, it’d be one of the top motorbike roads in the world. I think it should come with an advisory: ‘Not recommended for girlfriends travelling two-up’. That said, the scenery was beautiful – and changing, given that we climbed over 2,000m in a single day, up to 2,600m+. It was slightly cooler up to – but still more than 30 deg C for most of the day. In one of the places were we stopped for a quick break / drink of water, and old – and very, very drunk – guy came over to speak with Adrian. I have no idea what he was saying, other than he was asking about the route we were taking. That much, we could tell him using our very limited ‘pigeon Spanish’. To tell you the truth though, I don’t think he even knew what he was asking – so we had no chance of getting it! 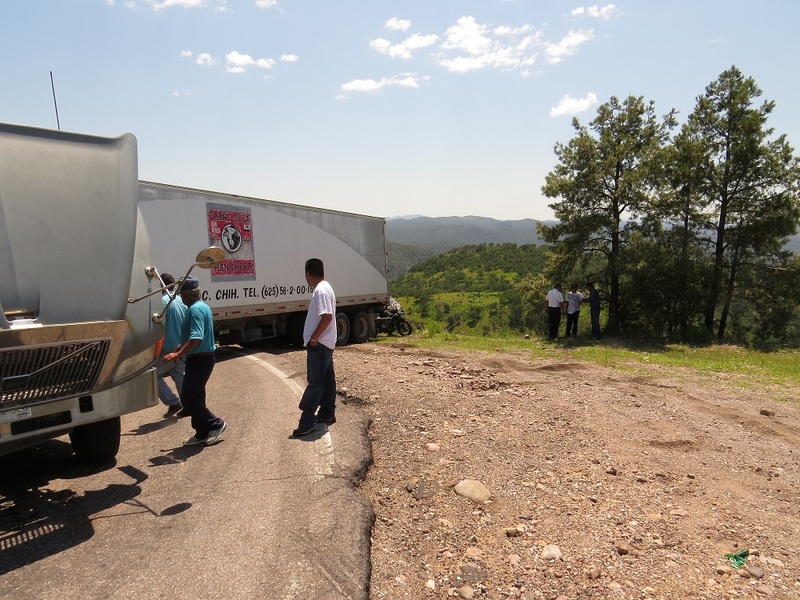 Along the way, we were also stopped by a jack-knifed truck that had broken down on one of the steep, windy sections of road. Adrian was able to ride around it, as were some of the other smaller cars. Everyone else though was just waiting while a few guys tinkered with the truck’s engine. That sort of manoeuvreability is one of the great things about being on a bike! 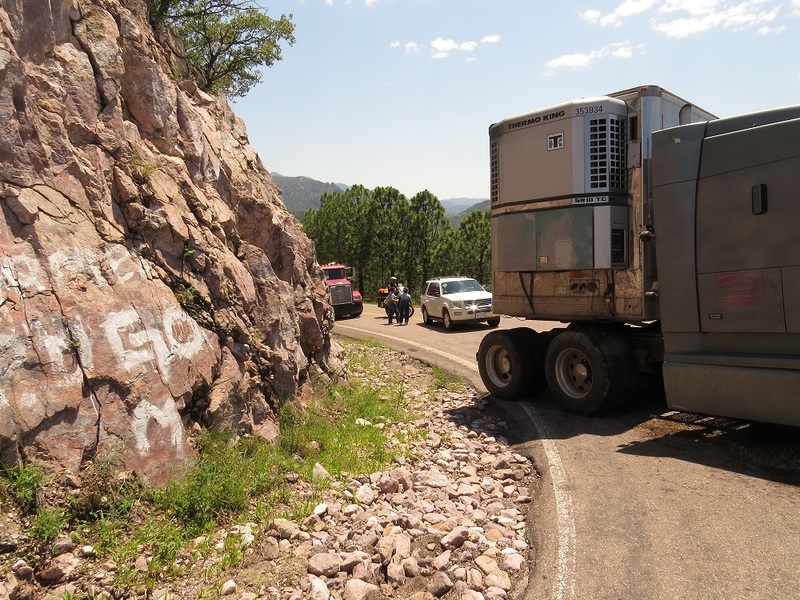 We also, at varying times, shared the road with cows, goats, horses, donkeys, rocks (from landslides down the very steep cliff face that the road was carved into), road runners, dogs, pot holes, cracks, topes, buses, trucks, lizards and a snake. So although Adrian thought it was an excellent motorbike road, it was also tough and required lots of concentration. 10 hours was more than enough for both of us! We were also stopped (and searched!) at one police/army checkpoint and waved through a second. I was thinking maybe we’d be hit up for a little road use fee or something, but nope – they just checked our paperwork, looked in the panniers and we were on our way. I guess they weren’t looking for Aussies carrying tents and hiking shoes?! One of the challenges is that here in Mexico, we just don’t know what ‘things’ look like. For example we wanted to find a little restaurant/burrito stand/any sort of food in a few of the towns we were driving through. We know what those sort of places look like in Australia and other similar countries (US, Canada, parts of Europe etc) – but here, we’re yet to get our eye in. A ramshackle hut by the side of the road with boarded up windows could just be the best tortilla place in town. Or – it could be a condemned building riddled with asbestos, alone but for the few stray dogs roaming around. So yeah, that’s something we’re working on! Creel, where we’ve stopped for the night, is a gateway town to the Copper Canyon. So it’s a little bit touristy, although from what I can tell, most of the tourists are Mexicans visiting from other parts of the country. There are references to the Tarahumara Indians everywhere, which is very interesting to me given that I’m reading a great book about the Tarahumara now, ‘Born to Run.’ We’ll be staying here for two nights, venturing into the Copper Canyons on a day trip tomorrow. You can just see Adrian starting to come around the back of the truck, on the grass. What you can’t see is the sheer drop about 30cm from where he’s riding.